OK, the first trial run was simply the placement of the 1980 front clip that I have been writing about. By the way the weather in South Florida is so good, that I have neglected writing on here for a some time and updating my progress, because I have been taking advantage of the cool weather. Thanks to the Canadian winds! So I return with the news of the new and proper installation of the 1980 Corvette clip. For those reading for the first time, and I am glad that I have about 100 followers already that have either commented or contacted me for some information. I am not a professional at restoring a Corvette. I simply have learned from many of the you tube videos and some of the old legendary Corvette masters that are still around working on Vette’s for 40 plus years. For those of you who do not know, I have a 1975 Corvette, I chose 1975 and or lower because of simply thing that I did not want to deal with, rust! The floor pans for one are not fiberglass in Corvette’s that are post 1975. Yeah you get the metal floor pan, and those rust my brothers and sisters. So 1975 and earlier have fiberglass floor pans. One less area of concern and not much inspection needed there. Just on a side note, I cleaned the floor pans both as well as I could and before I introduced some new floor pan plugs (which I purchased at Eckler Corvette fairly cheap) then I painted the floor pans with a rust-o-leum semi flatback. I just wanted to give it some extra protection, because even though the floor pan will not rust, the attaching elements can. So just a thought and tip on what I did. In addition to that I will add some extra sound protecting strip before I do the interior. So back to the 1980 Corvette front clip. I originally placed the front clip on before adding the SEM adhesive. This was the adhesive that was recommended to me to solidify the front end. Now I was ready to place the front end on permanently. So there are a few things that you will need if you are going to attempt this on your own. One is a good jack. Not the one that the Corvette brings from factory. You will need a strong hydraulic jack. Do not let the front end fool you. It is very heavy. Ideally you will need about three to four people to assist you in placing the front end clip. The SEM adhesive will be placed in several places to include both the right and left or (driver and passenger side) quarter panels. In addition, you have to make sure that you have the front clip on perfectly before adding the SEM multi-purpose adhesive, we will get back to that statement in a brief moment. You will have to check and re-check the closing and opening of the doors of the Corvette. Don’t worry if the front clip looks a bit separated from the tires, because it will eventually settle just right. Now back to the statement of settling perfectly. There is always going to have to be some modification. It does not matter that you are dealing with a C3 Corvette. The parts simply do not always fit perfectly just because you are placing a C3 part on another year C3 corvette. 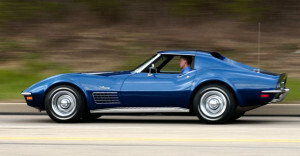 You will read on many of the Corvette forums that everything is inter-changeable. That my brothers and sisters is complete bull crap! You will need to modify some part of the body somewhere to make it work. Now not everyone wants to change the body style of their Corvette like I do. A 1975 Corvette that is being restored with original parts won’t be facing this situation that I encountered. I however, purchase the 1975 Corvette because the price was right for my project budget. Then the 1980 front clip and back clip came at a good price too. Besides the front end that I had on the car originally was an after-market front end, I just chose original over after-market. I will keep you posted on the upcoming paint job and interior modifications. Now, here is a side note. Many people want to start a project like a vintage Corvette. Well did you know that you can get financing for these projects? Many people do not know it. It is true. The financing is fair and affordable. In fact I am going to use this company for my next project, my intent it so own three Corvettes. One for me, and one for each of my boys. They help out quite a bit, and have taken an interest in vintage Vette’s. I will be purchasing a convertible Corvette, looking for something in the early 1970’s. Anyway this company has helped me out in the past, and I recommend them. Here is the easiest car financing out there. Let me know what you think?